What Does It Take to be a CertainTeed SELECT ShingleMaster™? Home Roofing What Does It Take to be a CertainTeed SELECT ShingleMaster™? At Rogers Roofing, we are proud to be one of the few roofing companies to qualify for the CertainTeed SELECT ShingleMaster™ designation. It doesn’t just let us offer some of the best roofing materials in the industry, it also lets us offer eligibility for top-notch warranties, and the peace of mind knowing that their homes have reliable protection from the elements. The company must be operating as a roofing contractor for at least five years prior to application, or one year as a ShingleMaster, a different level of certification from SELECT ShingleMaster. All job supervisors and at least half of the shingle application team must all be qualified Master Shingle Applicators™ prior to application. The company owner must take and pass the Business Fiscal Responsibility™ exam. The roofer must have proper insurance, including general liability insurance (for accidental property damage) and workers’ compensation (for workplace injuries). At the end of the day, it is you, the homeowner, who gets all the benefits when hiring a CertainTeed SELECT ShingleMaster. We get all our roofing supplies from CertainTeed themselves, so you have the assurance that the project will never run out of materials—a common problem with shady contractors—ensuring beautiful results to your roofing project. Hiring a CertainTeed SELECT ShingleMaster also makes you eligible for exclusive warranties. CertainTeed roofing shingles are protected with an Enhanced Lifetime Limited Warranty that covers manufacturing defects, including aesthetic ones that most manufacturers don’t cover. You would also be eligible for SureStart™ protection, a 10-year non-prorated coverage for materials and labor. Rogers Roofing serves Chicago and nearby areas in Northwest Indiana including Schererville, IN. 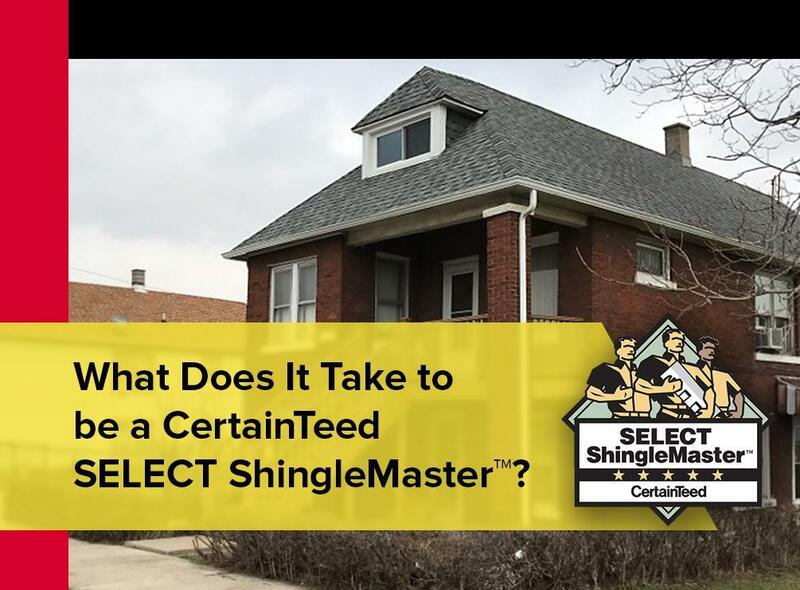 To know more about our ShingleMaster designation and how your roofing project can benefit from it, call us today at (219) 228-8210 (Indiana) and (773) 492-2270 (Illinois). You can also fill out our contact form to schedule your free estimate.